Hawaiian native plants represent one of the most unique collections of rare and endangered plant specimens in the world. From seashore to higher elevations, the island of Moloka’i is home to a number of these plants found nowhere else in the world. Extinction is their ever-present threat. Hui Ho’olana maintains a native botanical garden where numerous endemic species are cultivated in an effort to stem the tide of extinction and educate the interested observer and conservationist. Towering over the garden, exotic native koa trees shelter akia, a’ali’i, ulei, koki’o ke’oke’o, ko’oko’olau, ma’o, kulu’i, loulu, alula, and ilima among other endemic and indigenous species. Within the Hawaiian culture many of the plants have had specific uses from canoe and house building to dyeing and traditional medicine. Some of these practices continue today and, in addition, certain unique plant characteristics have been isolated to improve the strains of similar plants in other parts of the world. Thanks to Butch Haase’s inspiration, we continue to reintroduce the native plants originally growing in this area. 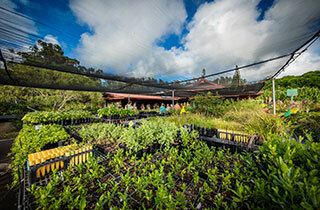 The results of his first planting project are seen in the Hui’s dry land forest with over 25 native species. Viewing such a collection is a special enrichment of one’s visit to this most isolated archipelago and an encounter with its fragile ecosystem. In 2008, after encroaching eucalyptus had been removed from the area, we worked together with Butch bringing in rocks and transforming the eroded dirt area above the lodge. Friends gathered together to plant over 800 natives grown from seed in our nursery and Miroschy added the lovely rock stairway. 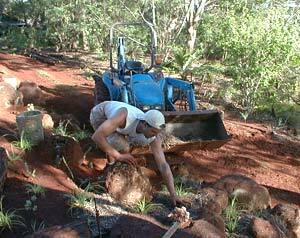 Over the last six years, with the help of over 75 volunteers contributing more than 10,000 hours, plus Hui revenue, donations from family and friends, AND a Conservation grant, we have been able to clear, terrace and plant over two acres with over 20,000 native Hawaiian plants, some endangered. Many of the mature plants are already producing seeds (which are collected and sewn) resulting in even more plants in our ever-thriving nursery. This remarkable project is now known as the largest private restoration of dry-land forest within the State – and serves as an educational center for people on and off this island. We were honored when kumu hula Puna Kalama and her halau blessed this new planting, giving it the name Ku Ahu Lei Mana (where the soul’s best is offered). Those who have made a donation, attended a workshop, taught a class, or volunteered their time and energy have contributed to this legacy: malama ka aina (protecting the land).